With Valentine’s Day on the horizon, it seems only right that everyone’s got romance on the brain… and it just so happens that one of the best love stories on TV can be found every Monday night on Castle. Castle and Beckett’s relationship isn’t just about smouldering looks and swoon-worthy sunset weddings; it’s also about the back-and-forth rapport that the two have had since the mystery writer first waltzed into Beckett’s precinct. It’s fun, it’s charming and it harkens back to the screwball comedies of Hollywood’s Golden years, so when we got the chance to talk with Kate Beckett herself, Stana Katic, at the People’s Choice Awards in January, we just had to ask about the insane chemistry between her and co-star Nathan Fillion. As it turns out, their resemblance to the couples of yesteryear is actually a totally intentional homage. 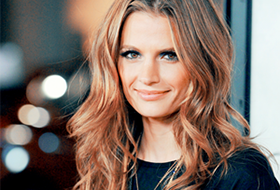 Katic explained that all of Beckett and Castle’s romantic banter has a very specific inspiration. “Andrew Marlowe and his team love writing that kind of Thin Man-esque storyline, so I think that it all starts with writing and after that, hopefully you’re about to bounce the ball back and forth with your partner,” she said. But while the writers’ favorite storylines might be centered on Caskett, Katic’s got a soft spot in her heart for a plot thread that helped define so much of who her character is. “I liked what happened to Johanna Beckett,” the actress explained when she took part in the fast-paced Against The Clock. Since Katic seems to love the more intense storylines that Beckett is tasked with on Castle, it’s no surprise that her dream guest star is one of the most serious actors in Hollywood: Daniel Day-Lewis. Now that’s an episode we definitely wouldn’t miss! In fact, it seems like Katic has quite a few great ideas for must-see episodes if her dream crossover is any indication. 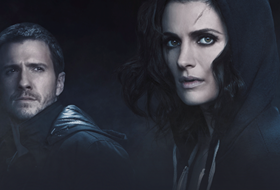 Check out the characters that Katic would love to cross paths in the twelfth precinct, along with the rest of her off the cuff answers in the latest round of Against the Clock!